Combi Packaging System's side belt drive case erecting machine form and bottom seal cases at speeds up to 15 cases per minute. Combi's new product offerings are a response to our customers' need for faster speeds. 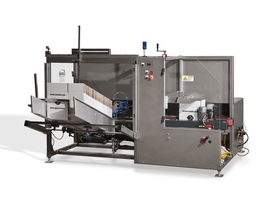 This case sealing machine is built with the same optimal durability, reliability and value the 2-EZ® family of case erectors has provided over the years. Our case sealing machine is engineered with the industry's strongest frame (lifetime warranty) for the most demanding 3-shift environments, the 2-EZ® SB and 2-EZ® SB Plus can readily integrate into your existing line. Combi's EZ-load walk-in case magazine and 3-minute "No Tool" changeover system are standard features. The 2-EZ® side belt drive units are designed for years of dependable service and can form and seal the widest variety of cases, from single wall to triple wall corrugated. The flat case blank stands vertically in the easy to load, walk-in magazine. The case blank is extracted from the magazine with vacuum cups and formed by a retracting squaring arm. The leading minor flap is folded using a pneumatic flap folding mechanism. The major flaps are folded up using a rotary actuator powered flap folding mechanism. The case is transferred into the dual belt drives where it is transported across the tape head and is bottom sealed with a 2" wide strip of pressure sensitive tape.